Finally, San Agustin Church in Intramuros completed my visit to the four baroque churches in the Philippines known to be world heritage sites when we had a stopover in Manila. 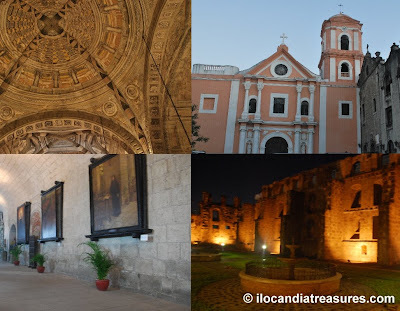 I have documented Paoay Church in Ilocos Norte, Santa Maria Church in Ilocos Sur, and Miag-ao Church in Iloilo. This is another treasure of the Philippines that truly showcases the magnificence of heritage buildings. The façade however was not that impressive. It was even criticized as lacking of grace and charm. It was plainly painted. The church’s main door was ornately carved. When I went inside, I saw the interior design. It was awesome. This is what made the church so beautiful. I attended the mass which was ongoing at one of the side chapels since the main altar in which the image of San Agustin is placed was readied for a concert performance on that night. After the mass, the monastery was opened to the public and I saw the old walls. This church was built and completed in 1607 during the Spanish colonial period. The design was derived from the Augustinian Churches built in Mexico and its interior is a copycat of the Puebla Cathedral in Puebla Mexico. The interior is in the form of Latin cross. It has 14 side chapels and I saw the salient feature of the church when I looked up the ceiling and walls. That is the trompe-l’oeil mural. This French word is an art technique that creates optical illusion involving extremely realistic imagery. It literally means to trick or deceive the eye. The church was declared in 1993 as UNESCO World Heritage Site and also declared as National Historical Landmark by the national government in 1976. This structure withstood several earthquakes that destroyed other Manila churches. The sturdiness is attributed to its elliptical foundation. This church is a popular venue for weddings. Most prominent personalities and celebrities held their weddings here. Concerts are likewise are being held here such as the San Agustin International Music Festival every year.